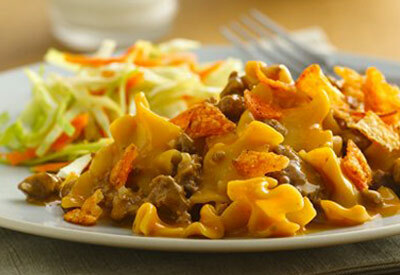 In 10- inch skillet, cook beef over medium-high heat 5 to 7 minutes, stirring frequently, until thoroughly cooked; drain. Stir in uncooked pasta and sauce mix (from Hamburger Helper box), milk, hot water, barbecue sauce and onion. Heat to boiling, stirring occasionally. Reduce heat; cover and simmer about 10 minutes, stirring occasionally, until pasta is tender. Remove from heat. Cover; let stand 5 minutes (sauce will thicken as it stands). Top with chips just before serving.